Happy New year Everyone! In this article, you will find our compiled 3rd Quarter Grade 1 Daily Lesson Log (DLL). We at DepEd Teachers Club aim to complete all the Grade 1 Daily Lesson Log (DLL) to make them available to our fellow teachers and help them complete their resources to make their efforts more directed into the actual teaching process. 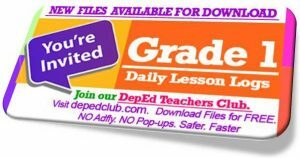 You will find the 3rd Quarter Grade 1 Daily Lesson Log (DLL) download links at the bottom of this article. If you have time, please read the article below for some background about the K-12 curriculum from the Department of Education.